Call API and parse results in OpenRefine. We developed the course in 2015 using OpenRefine 2.6-beta. We do our best to keep the content current with the latest version of OpenRefine. It is possible that some third party services referenced in the course are not available any longer or have changed their interfaces. Please let us know if there is out of date information. This course was developed by RefinePro in partnership with BigData University and Cognitive Class. 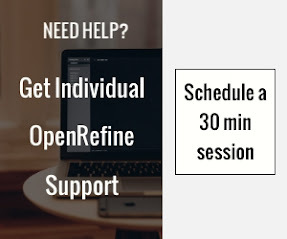 Since 2011, RefinePro has developed training programs for OpenRefine, including free online courses, in person or remote courses, and individual coaching sessions. Learn more about RefinePro’s training here. Labs can be performed using a Linux, mac or windows machine. More details are provided in the lesson 1.5 Installing OpenRefine and Getting Started. The Twitter Stream Analysis lab is optional and for practice purpose only. This lab is the first part in a series of two labs to map all closed projects in 2014 in Toronto that have created more than 10 dwelling units. The Lab Combining GREL together is optional.